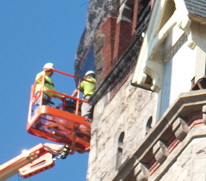 The Costello Dismantling team comes from a wide range of disciplines – including business management, structural and mechanical engineering, crane and rigging expertise, safety and industrial hygiene, scrap metal management, building demolition and material recycling – all brought to the singular focus of your project needs. 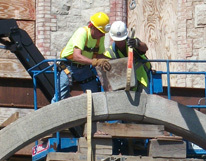 Costello will expertly and professionally manage your project from the planning phase to final clean up. Safety is paramount in our business. We are committed to reducing any risk to our workers and their surroundings. This begins with a philosophy that relies upon equipment and technology to take workers out of harm's way. By using and maximizing the proper equipment, we reduce or eliminate` exposure of workers to potentially hazardous situations. Safety is the overriding core value of every work plan, and safety issues are constantly evaluated as situations arise on the job. "Lots could have gone wrong here. Nothing did. The people that we had on board here – Costello and other subcontractors – have done an excellent job." - Robert Mortimer, Harvard University, on the removal of an 18-foot thick concrete foundation next to an active high-energy physics laboratory. We are committed to recycling, and to diversion of materials from landfills and waste streams. We incorporate the residual value of that material into our projects, and that translates into savings for you. "We seek out the latest equipment and technology to derive better products and higher recovered value from the materials we harvest, for the benefit of our projects and the environment" - John Costello, Project Manager, Costello Dismantling Co., Inc.
Costello Dismantling's mission is to continue as a leader in the dismantling industry through embracing a culture of innovation, safety, integrity, and respect for our employees, clients, and the environment. "I would definitely hire Costello to do all our demolition work in the future..." Jack Graves, Superintendent, Northern Construction. "I heard good things about Costello, and they're true." William G. Redfield, Director, Chatham Water and Sewer Dept.